The Vallee Foundation is delighted to announce the first recipient of the Bert & Natalie Vallee Award in Biomedical Science: Michael M Gottesman. Michael Gottesman’s long career as an outstanding researcher and administrator working at the leading edge of cancer studies is being recognized at the annual meeting of the American Society for Biochemistry and Molecular Biology in San Diego in late April. Head of the Multidrug Resistance Section and Chief of the Laboratory of Cell Biology at the Center for Cancer Research in Bethesda, MD, Dr Gottesman has developed molecular tools to define the drug-resistant genes found in human cancers, a first step to designing effective medicines. “His body of work identified the intricate processes by which cancer cells resist a variety of anti-cancer drugs, demonstrating a need for new approaches for the development of better drugs,” said Dr Harold Varmus, the director of the National Cancer Institute. In addition to his ground-breaking research, Dr Gottesman has, for the last two decades, been deputy director of the NIH Intramural Research Program, the largest biomedical research institution in the world. There, he coordinates and oversees all of NIH’s internal research, recruiting and training, as well as managing a rigorous scientific review of each research project every four years. The Vallee Foundation is particularly delighted that the ASBMB has selected Dr Gottesman for this prestigious award; many years ago, Dr Gottesman worked in Bert Vallee’s laboratory at Harvard Medical School. 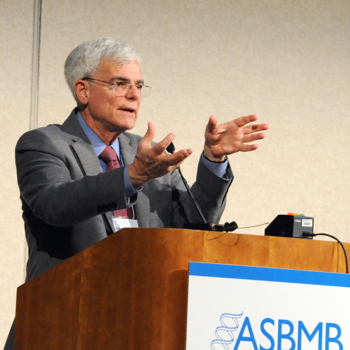 His talk on “Exploring the Complexity of Multidrug Resistance in Cancer” was delivered at the ASBMB 2014 meeting on April 27.